Well, today's the day! 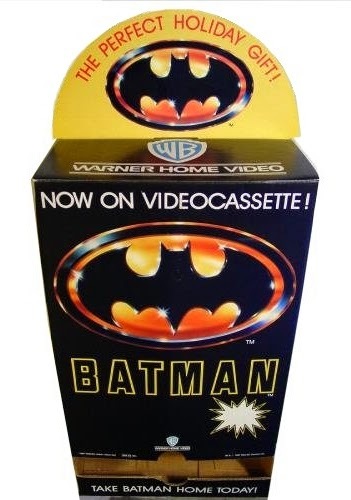 June 23rd marks the 25th anniversary of Batman's release. Yes, I can't believe it's been 25 years since the Dark Knight made the whole world know his presence by simply saying "I'M BATMAN". For those who weren't around, this movie was everything and superhero films were changed forever. Thank goodness too, because had it not been for Batman, we'd still have gotten a mid 90s X-Men movie with bright spandex costumes and Ethan Hawke as Cyclops. That's not a movie anyone would've needed in anyway shape or form. Unless we got Neve Campbell as Rogue. But Batman made superheroes serious again, in the same way Superman 78 made Superman believable. Also, as explained in an earlier post, the effect it had on toys was massive. 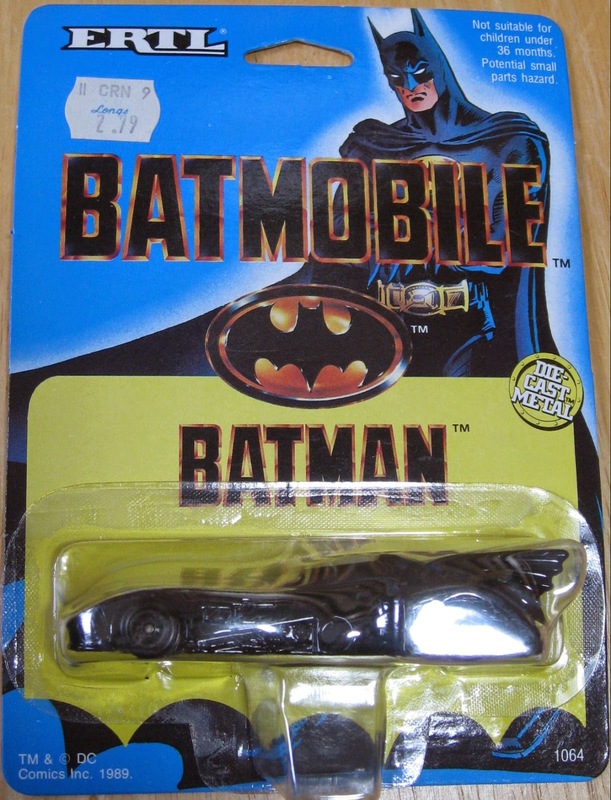 Everybody had that Toy Biz Batman with the extended utility belt and a Batmobile. We had some pretty sweet toys to look forward to on Christmas morning. But what about the other stuff? What about the other merchandise that when you turned around and saw everyone else owning? Maybe a shirt, hat, watch? Everyone that year owned at least 4 things with the Bat logo. Batmania was huge. So let's take a look at the other stuff that maybe you had or didn't know existed! The coolest shoes I never had. Converse always brings their A-Game and this is one of those awesome shoes that everybody wanted. 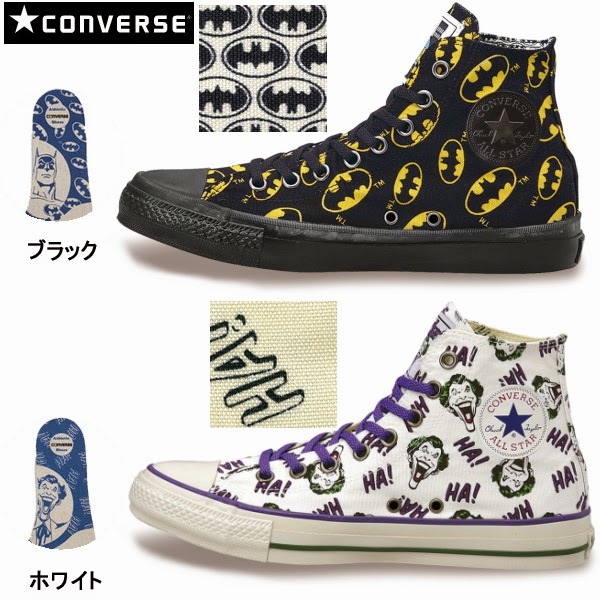 The all over Batman shoes were great, but the Joker wins this one. 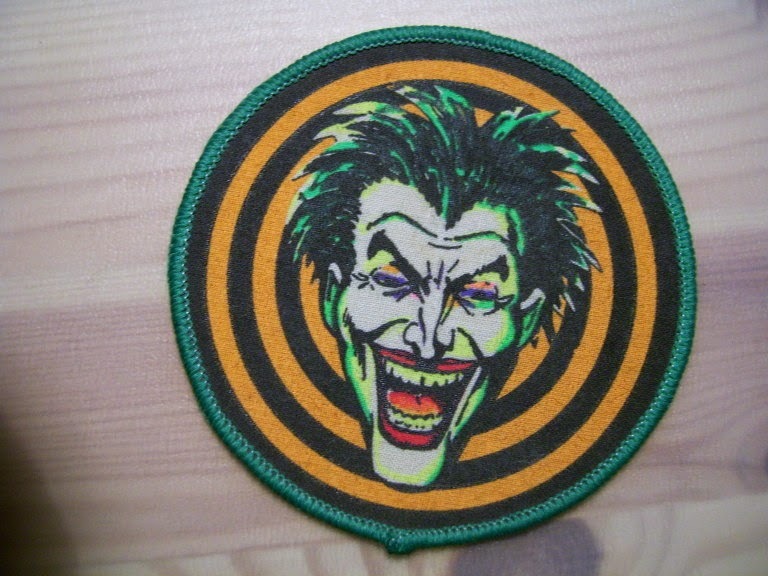 Joker Logo? No thanks, Joker is fine with putting his ugly mug and laughing hysterically at your poor friend who's wearing Buster Brown shoes from 1978. 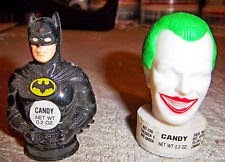 The 1980s were an amazing time for figural candy dispensers. 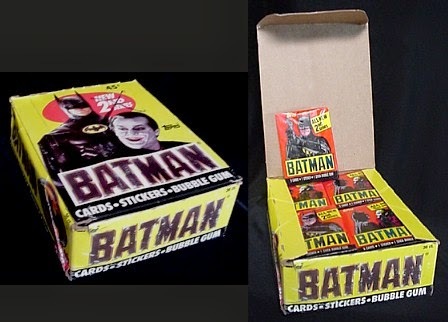 Alf, ET, Gremlins, Max Headroom, Freddy Krueger and now, the Dark Knight and Harlequin Hoodlum themselves get the old Topps candy head treatment. To us kids, though, the candy wasn't the important part for once. In fact more times than most, the candy tasted like Chiclets left over from the 70s. They weren't a treat by any means. I'd say day old Salisbury steak is more of a treat than this candy was. But it's obvious we want these for the figurines. As children, seeing our parents decorate their rooms with knick kancks and paintings, we figured these would be the closest things to adding a little class to our bedroom. In fact, I remember one of my friends having a Joker on her tiny, kid sized piano kinda like Beethoven on Schroeder's piano. Good idea! Not a fan of the action figure offerings? Think they're a little too big to keep anywhere? Or maybe you're just looking for another decoration for your desk? Either way, the masters of diecast replica, ERTL had you covered. A tiny Batmbile and Joker Van were perfect stocking stuffers as well as guaranteed victory in back yard car races. While a little more clunky, the Joker Van could provide a perfect distraction while you send the Batmobile bolting down the dirt track you and your friends made. Curse words and "you cheated!" would follow, but Joker Van or not, Batmobile always lead it's way to victory. I don't know about you but it looks like a cheap Milton Bradley game piece. On top of that, there's no Joker logo! Even bootleggers have standards, but I'm assuming this BATMANSET shipment wasn't top priority. A shame on you, a shame! I have to admit, I didn't know Taco Bell even existed until the early 90s, so I missed out on these promo items. 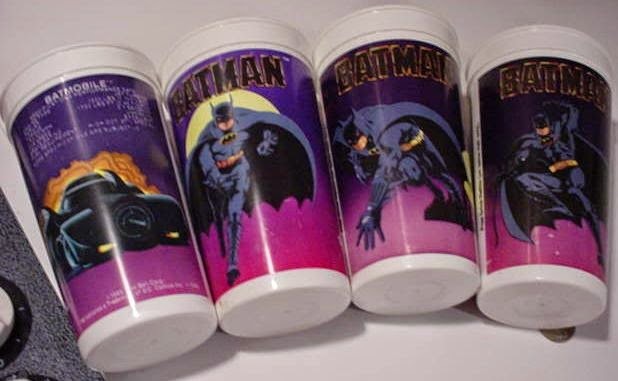 All I'm aware of is the variety of 4 cups depicting Batman in 3 different poses and one Batmobile cup. 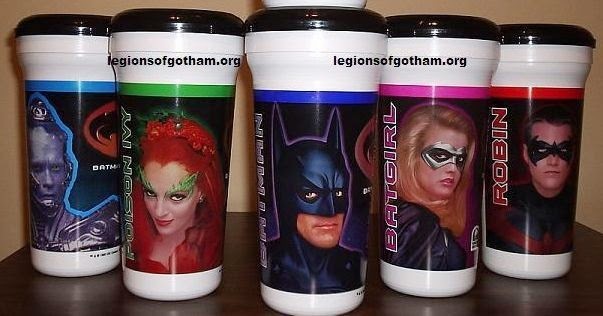 These are some pretty cool looking cups, I gotta admit. But the true prize is that display poster, most likely hanging up in the dining room. Some cool images, a phony newspaper, that amazing logo and a printed autograph from Michael Keaton himself. That's a cool item I'd be on the search for. 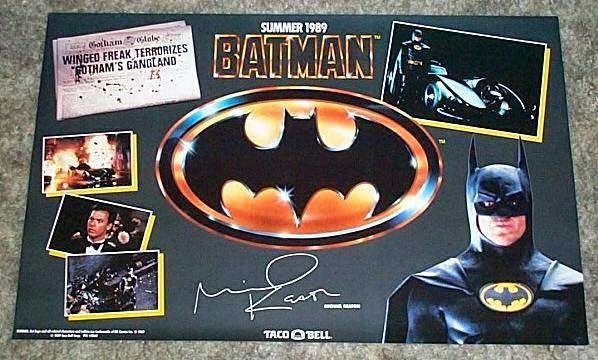 Side note, Batman returned to Taco Bell in 1997 for the release of Batman and Robin. The cups were more interesting than the actual movie itself. photo credit to Legions of Gotham. In the 80s, no property went without it's own trading card set. Every band, show or movie had a set of cards. In fact, I distinctly remember owning Max Headroom and Growing Pains cards and putting the stickers on the headboard of my bed. And of course, the hottest movie of the year can't go without TWO trading card sets. Stickers and famous scenes of the movie peppered this box as well as the famous "build a mural" on the back of sticker backs. Everyone had these, in fact I'm sure if you looked hard enough, there's most likely a Bob the Goon sticker stuck to the under lining of your dresser. In a hurry? Don't want to run around the store looking for a gift for your brother in law? This beautiful tape dispenser has you covered. Filled to the brim with the years hottest tape, all you had to do is grab the tape and head to the register. WB definitely pulled a great idea here. Hanging from the wall, you could get shopping over and done with in no time. It's a shame these dont exist anymore, I'm sure they would solve a lot of headaches at the register. Plus, it just looks cool. Yes indeed. 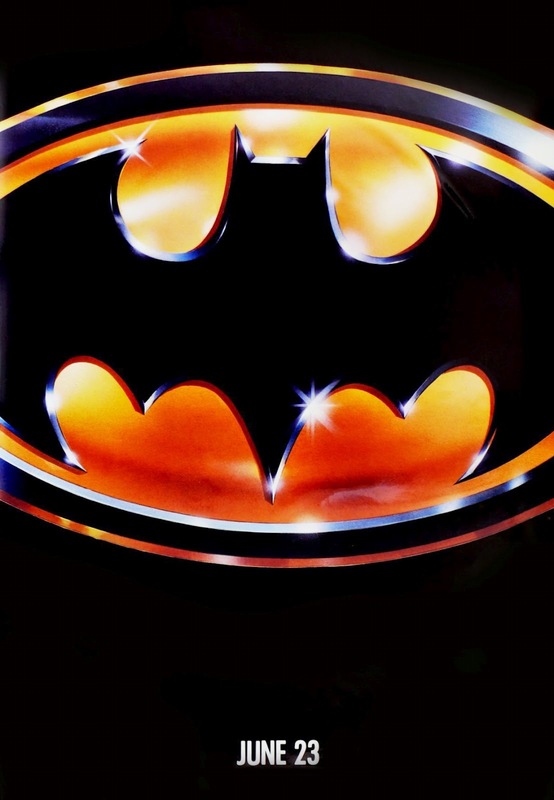 Even before the movies release, Batman posters were stolen from bus stops and walls of buildings in inner city. It's easy to see why. It's an amazing logo and a piece of late 80s art(and my current iPhone wallpaper). Having this hang in your room put you in a class of cool all itself. The logo still is remembered dearly and holds a spot in many poster collectors. 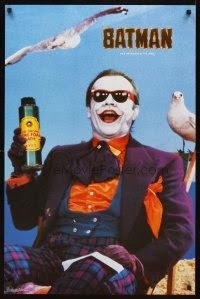 However, if you were just looking to spruce up your party pad, you needed to own this Joker poster. Look at how relaxed he appears to be at the beach. That's where you want to be. Maybe not with a can of Smilex, but it looks like he's having the time of his life. This poster summed Joker up in one frame and was seen in every boys room for years. First off, the box sold the cereal. Look at it! It's nothing more than the movie poster itself which was already an attention grabber. 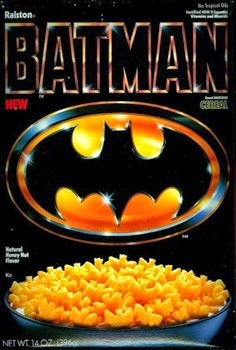 But add a bunch of Captain Crunch in Bat form, and you just sold millions of boxes.Of course, most remember the bank that was attached to the front as an awesome givewaway that we ALL remember. The cereal was pretty good, but if you're looking to taste it again, just grab a box of Captain Crunch. If you're looking to find the bank, just head to the flea market, you'll be able to find one. And if you're lucky, you'll find a full box still sealed just like I did back in March! There you have it! These are definitely some of the best of the best items that had a Bat logo on it! There's literally thousands more but these were my personal favorites. Did I leave some out? Please add your picks!